2-CYCLE OIL | Tallman Equipment Co., Inc. 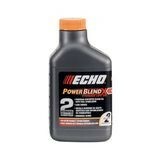 The ECHO Power Blend 2-Stroke Engine Oil with Fuel Stabilizer blends with 89-octane gasoline at a 50:1 gas-to-oil ratio for clean-burning, steady performance. The oil includes a fuel stabilizer to maintain fuel's quality. PowerBlend® XTended Life™ is an all synthetic blend fuel mix oil and is certified for use in all air-cooled, 2-stroke, outdoor power equipment engines. It meets and exceeds ISO-L-EGD and JASO M345/FD requirements and has superior cleaning capabilities while minimizing exhaust port blockage. It also protects against rust, wear, and corrosion and provides low smoke emissions.